2010 | polystyrene sheet | steel legs | height 1.30 m. | 3x3m. 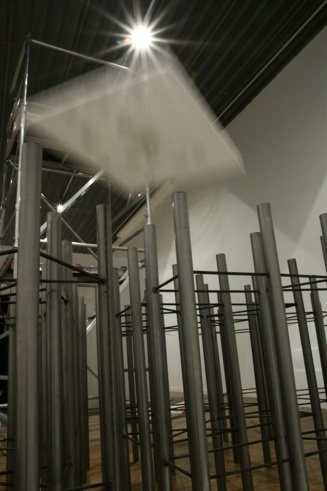 Produced for the exhibition Suspended Spaces #1, falling chamber uses the height of the exhibition venue (about 20 feet) to stage the fall of a sheet of polystyrene, which drops down and comes to rest on a mass of metal tubes erected on the floor. When the presence of a spectator is detected, a small motor affixed to the ceiling triggers the fall of the sheet. This latter, attached by a cable to a pulley, is then once again hoisted up to the ceiling. Presented as a variation on the theme of suspended space, this installation develops in time—the time of suspense and waiting for the fall, and the time of the unpredictability of the sheet’s flight and then its settling, when it comes to rest on this unlikely stand after its fall. Numerous botched landings will get the better of the fragile sheet which will end up partly in tatters on the floor, before being replaced by a new one. This grand mechanical and clumsy gesture, endlessly re-attempted, thwarts the expectations of visitors. A small architectural volume—“an inhabitable hollow form”—also made in polystyrene, is fixed on this large, thin sheet. 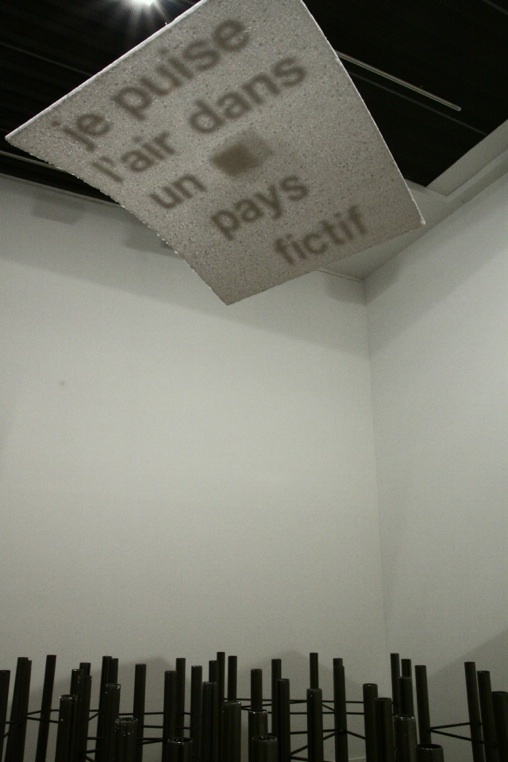 Before falling, the polystyrene rectangle, suspended half-way between floor and ceiling, floats horizontally in space. In this position wording appears through it: “I am taking the air in a fictitious country”, a sentence taken from the Paul Claudel collection Cent phrases pour éventails, short poems inspired by the Japanese haiku. Air and gust seem to inform this sheet which spins as it falls, at once light and cumbersome, but too heavy not to be squashed, at random, on the suspended stand made of steel tubes. The sheet then remains lying on this stand for several minutes, showing spectators its upper side. While the sentence is no longer legible (the letters appear on the other side), the chamber, that small volume placed on the plane of the sheet, becomes observable. A small door cut out in the polystyrene lends this block the status of an architectural maquette. But the inside of the volume is barely revealed. The installation refuses to be pinned down in a narrative: with each and every fall, a non-narrative fiction takes shape, open-ended, as is the scenario of the flight of the sheet, which alters every time it is repeated, beyond any control and any possible prediction. 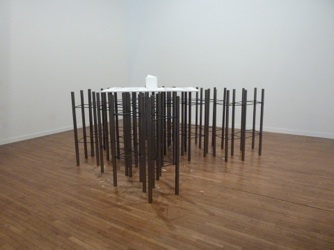 Beneath the form of the light sheet of polystyrene and the steel stand fixed to the floor, Denis Pondruel singles out two states of one and the same artistic proposition: “On the one hand, the idea, the work in the native, light state. On the other, the art object, provided with a stand, in an exhibition situation”.